The esports scene in India has grown by leaps and bounds since the days of cramped LANs in local cafes and a thriving ecosystem of TOs, orgs and players have been on the forefront of driving the change behind it. It came as little surprise when COBX announced their $200,000 LAN considering that the company has been trying to build their repertoire in esports for a while now. 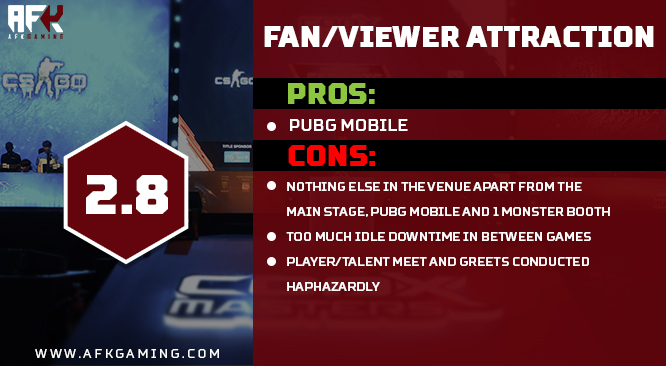 With two of India’s best teams (Signify Dota 2 and Signify CS:GO) having originated under their banner and the financial backing required to pull off an international event, COBX Gaming seems to have gone all in on the COBX Masters, an event designed to put them on the global map as a credible TO and have their names etched in the global esports landscape. How did the first time TO perform? What were the high points and is there room for improvement? We break down COBX’s performance bit by bit, play by play in an extensive in-depth AFK Gaming report card! The first conundrum is, of course, more of a moral one - What’s the benchmark we judge the event by? First-time TOs or a $200,000 LAN with international teams and talent? Here I have taken the middle ground, keeping both in mind while prioritising the viewer experience, both on stream and for those at the venue. Each of these parameters has been broken down into several sub-parameters, with a weighted marking system for each criterion. All parameters are scored out of 10, with 10 being highest or best. We have compiled the scores from each category to arrive at a final score for the event. Do note that this is the first event we have judged on the basis of this system and we plan to do so for all coming LANs that we attend. Therefore the score for COBX Masters will serve as a benchmark for future events and has little value just as a standalone number by itself. 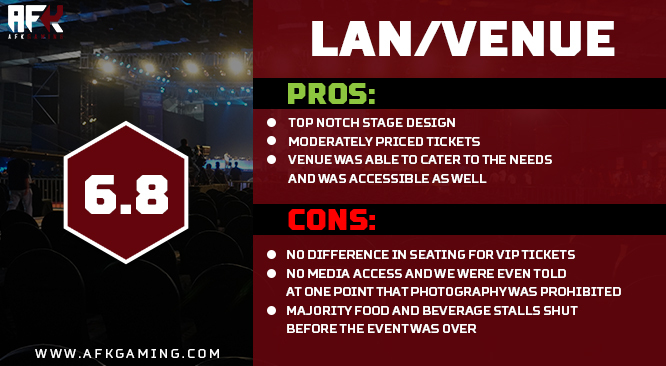 For production, we have judged the event based on the quality of streams, LAN production, talent, content/aesthetics and delays. The production we experienced on LAN was quite fresh and innovative and props to the organizer for trying something new and executing it quite well. What I’m talking about is the live on-screen stat tracking for each player. It was a neat addition that added value to the viewers and was implemented for both Dota 2 and CS: GO. Design-wise, many of the assets, transitions and default screens did meet the mark as well. However, the quality of the stream as confirmed by multiple sources was very sub-par, with on-stream audio issues plaguing the viewers. 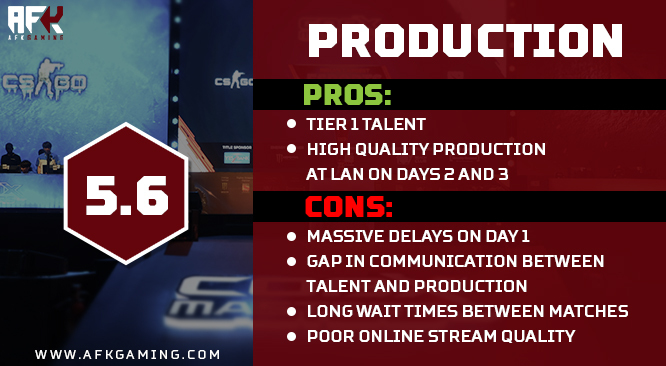 It’s also important to factor in the fact that the production quality on stage on Day 1 was sub par with major delays, awkward observing, glitchy screens and a fair few in-game issues. Day 2 was significantly better thought and we're told it's due to the event staff and management having worked through the night to fix the issues. The casters for both games were tier 1 talent which was a major plus point and even the panel had some pretty decent names in the list. However, there was a significant gap in communication between the hosts and the production, often leading to comical errors such as this one. This is some OP production quality. from frikinjay on Vimeo. Also, and this cannot be said enough is the need for research as hosts, who made bold claims that this was the first multi-game international esports tournament in the country when in fact it wasn’t even the first one at the particular venue itself. A critical part of running a successful esports event is communication with fans and viewers. Social media plays a critical part in this. Posting timely updates, schedules for the day, building hype leading up to the event, and creating more traction as well as buzz are all essential. On this front ,we judged the event on the frequency of posts, aesthetic look of posts, responsiveness of the team to queries and questions that fans had and timeliness of posts. Updates and hygiene content via COBX channels were satisfactory but could have done with a bit more punch. There were too few images coming out from the LAN itself which is my one point of concern. Otherwise, most of the updates containing basic information were on time and had relevant information. Pre event updates about match schedules, stream links and more could have been better planned. The hype leading up to the event could have certainly been worked on along with ticket sales, and it was evident that there was a distinct lack of paying members in the audience. The LAN setup was undoubtedly the best part of the event and looked extremely crisp and professional. 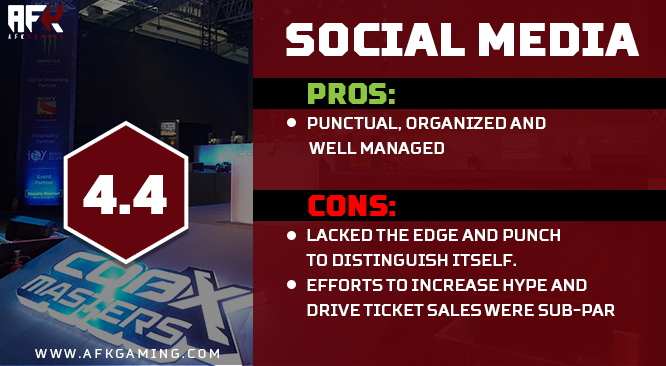 The venue had already established itself as a possible location for esports events with DreamHack Mumbai being hosted there a few months prior. 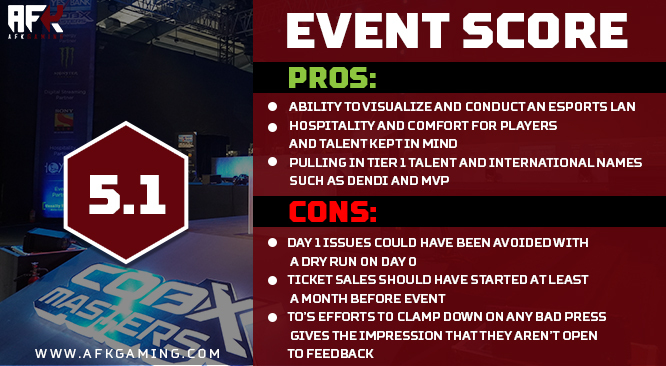 And while the choice was concerning given the problems that DreamHack faced there, it seemed like things stabilized post Day 1 of the COBX Masters. The stage setup with 3 massive screens made the viewing experience much more immersive while there were additional effects like fire and smoke machines to build hype. Food and beverages were also priced moderately and were up to the mark. The location was easily accessible and close to major hubs which made commuting relatively easy. However, the one major gripe I have with the event was the lack of VIP seating. Despite having purchased the premium tickets, we discovered that there was no enforcement of rules regarding separate seating area which basically meant that we had paid more than double the normal price for just a few goodies. 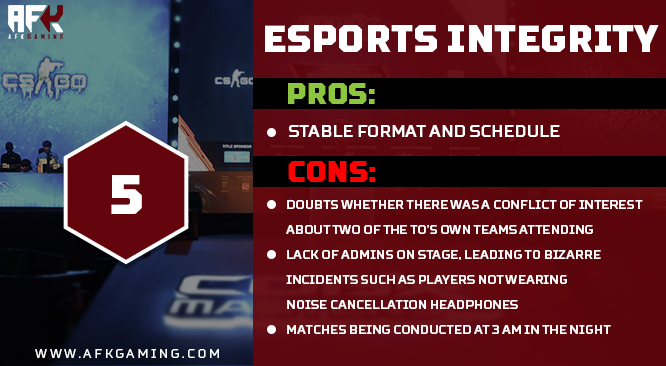 Esports integrity is a category where we judge the core esport parameters of an event such as seeding, scheduling, enforcement of rules etc. In this category, COBX Masters were already at a disadvantage because of the concerns of conflict of interest. Having fielded teams in both Dota 2 and CS:GO there were concerns that groups had been seeded to offer these teams an advantage. The evidence suggest that this was not the case and the groups seemed reasonable and fair by our account. However given the situation, the organizers could have publicly revealed the seeding process to allow more transparency. The format was as comprehensive as the schedule could allow. However, delays on day 1 meant that teams had to play till well past midnight which is never an ideal situation. The major issue, however, was an incident which took place on day 1 that never should have happened in the first place. You can read about it here. This is an area that needed a lot of work according to me. Given the long wait times, the need for side activities and filler content was obvious but there was none to be found. The one PUBG Mobile section did little to fill the downtime and was mostly a separate event of its own. Even on stage, some of the activities that did take place were quite mundane and slow. The filler content that the teams had shot earlier, consisted of childish games like flipping coins into cups, was cringy, to say the least. Overall, the event had a few highs but they simply weren't enough to overcome the lows. The biggest disappointment for us was of course, the lack of opportunities for fans to interact with their heroes - the international players and talent. It's truly a moment of catharsis for COBX to bring stalwarts of the esports scene to India. However the opportunities for fans to meet these personalities were almost non existent. One particular attendee that we spoke to was on the verge of tears towards the end of the event when he realized that having purchased a VIP ticket and attending the event all day every day was not enough for him to be able to take a solo picture with his idol - Dendi. From the perspective of a casual attendee though, day 1 aside, days two and three were worth attending and had some entertaining games as well. On a personal note, the event had quite a few redeeming factors and I would have loved to see more members of the Indian esports community, but sadly this wasn't the case. With this being said, I think that COBX has the potential and the resources to be able to pull off such events in the future with a few tweaks of course. I'll be keeping my fingers crossed and looking forward to seeing what they have in store for us next.